CAD Studio has recently released a couple of interesting new software products. All these tools can streamline your workflow for handling CAD and BIM data in AEC projects and in GIS/mapping. BIMsign is a new Revit add-on application. It can protect your BIM content by adding a unique permanent invisible watermark signature to all your Revit projects and families. You can use it to protect your intellectual property (IP) as you can prove the ownership of the original content in any future BIM files which are based on this signed document. You can "sign" individual RVT/RFA files or your company templates. BIMForMe is a new cloud application which opens BIM data from Autodesk Revit for all types of users. BIMForMe is an advanced software that helps investors, owners, contractors, managers and users of buildings to easily navigate in a building information model (BIM) and quickly find any requested information. This web tool does not require any knowledge of complex BIM authoring and 3D modeling systems and so it opens valuable BIM data not only to building professionals but to all non-technical users. The application BIMForMe brings features for working with BIM data created in Autodesk Revit software and any accompanying documents - all in an intuitive and user-friendly environment suitable for both experienced professionals and laymen. twiGIS is a new web mapping application by CAD Studio. It enhances existing slow, complex and hard to maintain mapping portal and GIS clients which are often incompatible with modern touch-based mobile devices. The main advantages of twiGIS are the quick and intuitive user interface, compatibility with mobile devices, handling graphical and textual data, independence on your enterprise GIS system, low requirements on IT infrastructure and a very wide range of supported data types. Any untrained person can immediately start to use twiGIS. 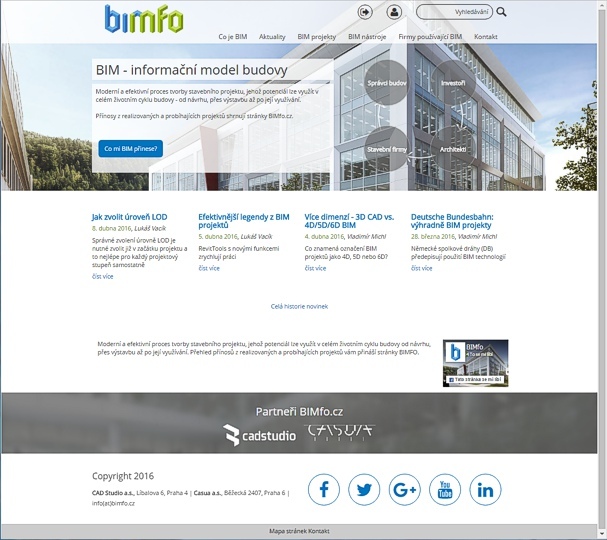 The latest member of the CAD Studio product family is the today released web portal BIMfo.cz operated by the CAD Studio and CASUA companies. It helps Czech and Slovak architects and AEC professionals implement BIM standards and processes. 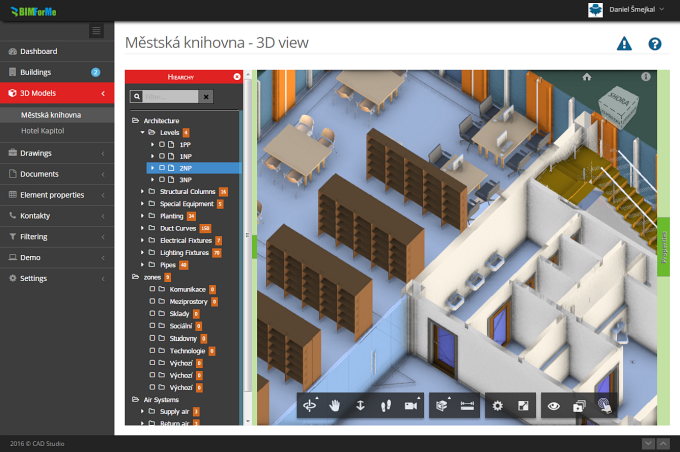 You can find here the latest BIM news, best practices, a catalogue of Czech BIM-ready companies, sample BIM projects (screenshots, photos, BIM data in an interactive A360-viewer) and other BIM-related goodies.